Mike Powell, Skate Guru from K2 Skates and Rob Gill, of InlineSkates.com, review the 2015 K2 VO2 100 X BOA Mens Inline Skates. So, we're talking about the VO2 100 X Boa Skate from K2. Phenomenal skate. Moving into that true high-performance type of skate. What's the first feature that really jumps out at you with this skate? Well, it's the most important feature in all K2 skates and let me tell you a little story, Rob. Once upon a time, back in the early days of inline skating, people built their inline skates like ski boots and that was not cool. K2 decided we were going to change the whole game and we're going to create a new technology - the Original Soft Boot - and we're going to build our skates like a piece of high performance footwear. And that's what we did here. So, when you're skating in a K2, you're skating in piece of high performance footwear. You try on a skate from any of our competitors, try on a K2, you're going to realize that comfort is found in K2. For sure. I absolutely love the fit of K2 skates. They are so comfortable. And now, continuing with how great this boot is - a great lacing system and an awesome performing cuff on this skate too. Yeah, so with this skate you get the VO2 cuff which is going to offer you a ton of support. You combine that with your buckle and your Boa Closure System - Boa is by far the best closure system that we've ever put on any inline skate and it's pretty much a dial that you pop out to get into the skate, it will allow you to just pull the tongue up, you get your foot in the skate, you close the dial, twist it and you're able to shift on the fly, you get a perfect fit any time and, you know what, Boa is guaranteed...tell them how long it's guaranteed for. It's guaranteed for life. That's right, guaranteed for life. So, this is the best closure system and it's going to last your entire life. So, moving down the skate now, even more features on this skate, an aluminum frame, larger wheels and kind of a unique wheel set up on this skate too. Yeah, so it's a Hi-Lo setup which is pretty awesome. What it does is it creates a lot of maneuverability but it also get you into a better skating position. You've got the 100mm wheels in the back, 90mm wheels in the front so it creates that maneuverability, creates that little forward lean, it's going to get you into that perfect skating position. And then an ILQ9 Plus bearing on here is just provides such a smooth roll and a nice top end speed on this skate. Yeah, the ILQ bearings are the only bearing that were ever engineered specifically for inline skating and this is the best of ILQ. For sure. So now, who is this skate for? It's for your serious skater, someone who is going to be out there quite a few times a week using skating as a part of their workout and you know one thing that we left out but I'm not going to leave it out, I'm going to drop it right back in, is a feature that we put in here called the Vortech Ventilation System. And these serious skaters that we're talking about, they're out there logging 20-30 miles at a time and, when we were testing this skate, we found that at first, our socks are getting a little bit sweaty and that was unacceptable. So, we decided to create a technology that eliminates any moisture in the skate and we've got a Vortech Ventilation System that is a series of 7 channels that go underneath the foot, you've got an intake in the front, exhaust in the back and air is going to be forced through the skate, you're going to be able to have your foot nice and dry your whole time out there inline skating. It creates a much more comfortable boot. For sure. Such an important feature on this skate especially for someone that's, you know, I mean, they're going to be skating much longer distances in this skate for sure. So, there you have it. 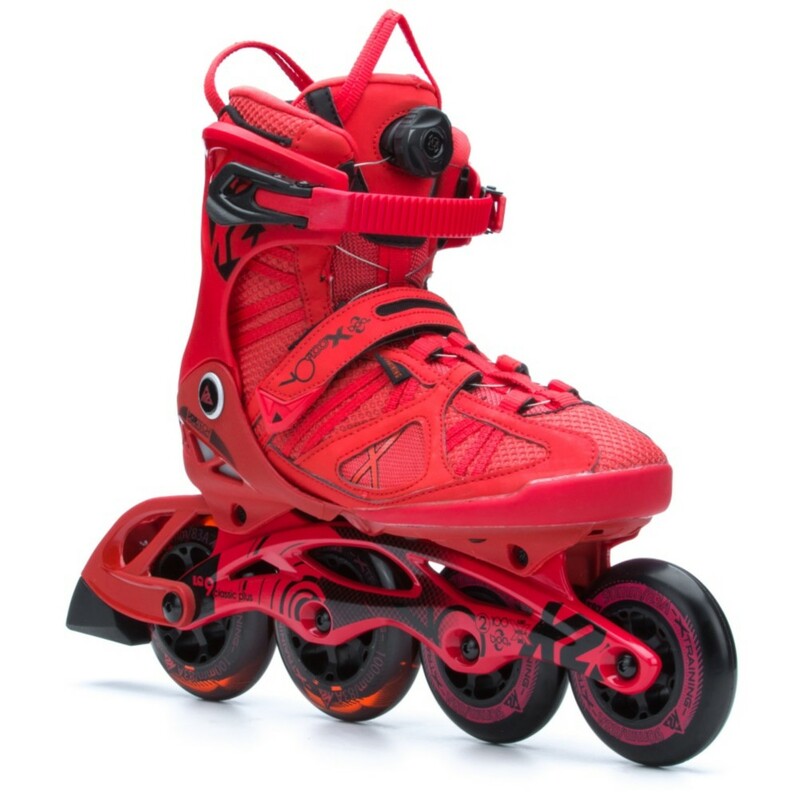 You can check out the K2 VO2 100 X Boa on inlineskates.com and thanks for joining us on the Daily Spin.